Good morning friends! My post for today was initially going to be two separate posts but due to lack of time this past week, I will be condensing it to one....a twofer if you will. 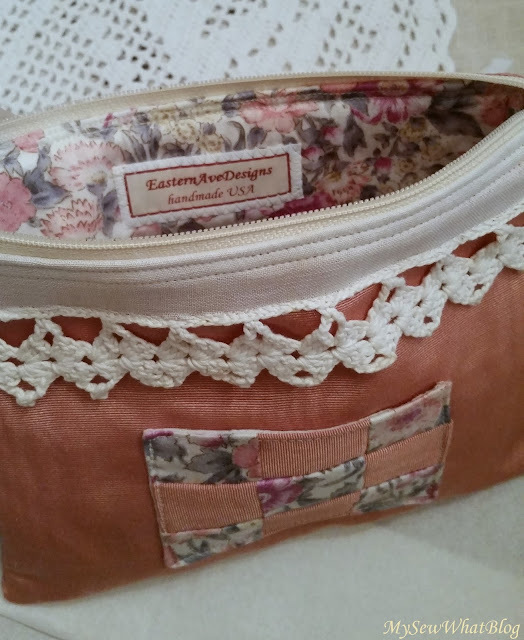 On Tuesday I played around with my cosmetic pouch pattern and some vintage fabrics and lace. I happen to have some of this (I call it salmon colored) fabric leftover from prior projects and I love it. Its a moire taffeta that makes these little projects look so elegant. 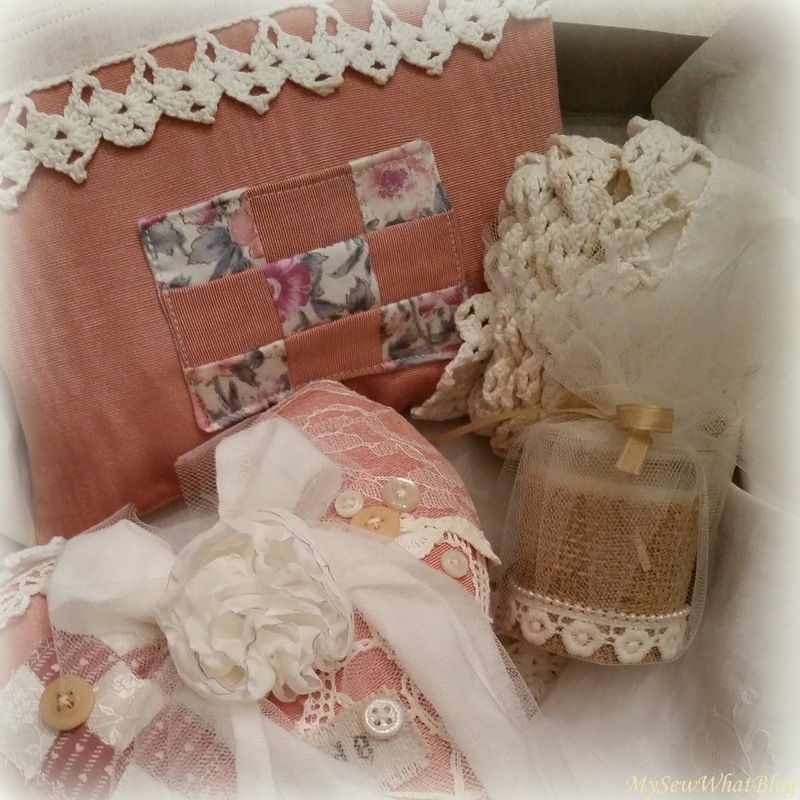 I have used it on my vintage inspired hearts and other little ornaments. Anyways, I made up this little bag shown above, added a little faux quilt pocket and some vintage lace. 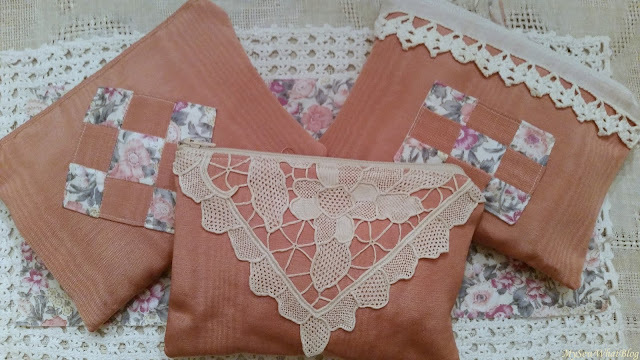 It turned out so well....I was mostly curious to see if adding additional bulk (from adding lace in the top seam) would make it difficult to sew....it wasn't too bad and an additional row of top stitching helped to flatten the added thickness. Here is the inside lining. 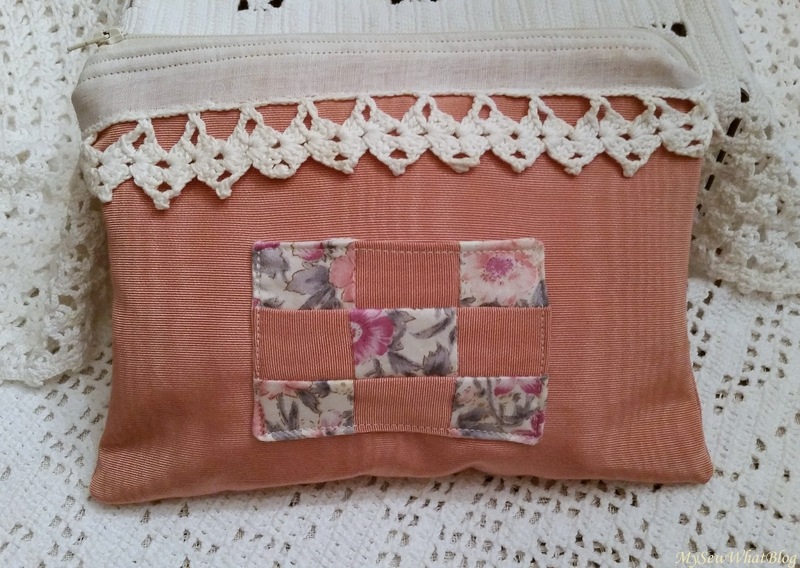 I used a pretty floral fabric that was dated 1990 on the salvage edge. 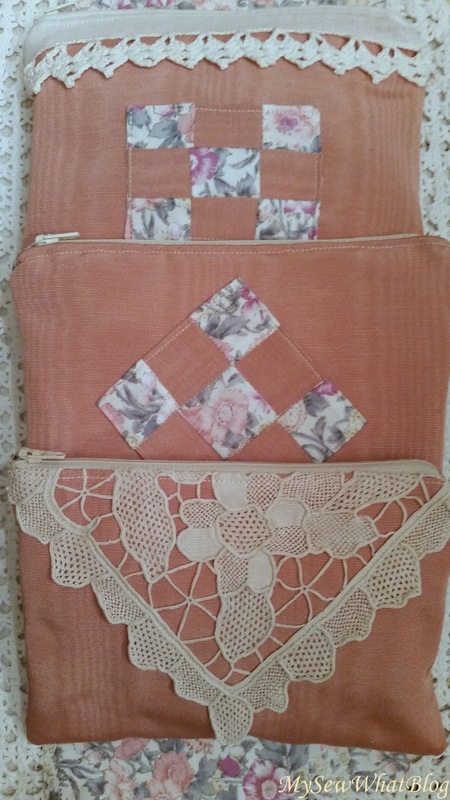 This one obviously has no lace added, the quilt is actually quilted and is sewed down on all four sides. ......and as it turns out, the third was a charm. This is my favorite! 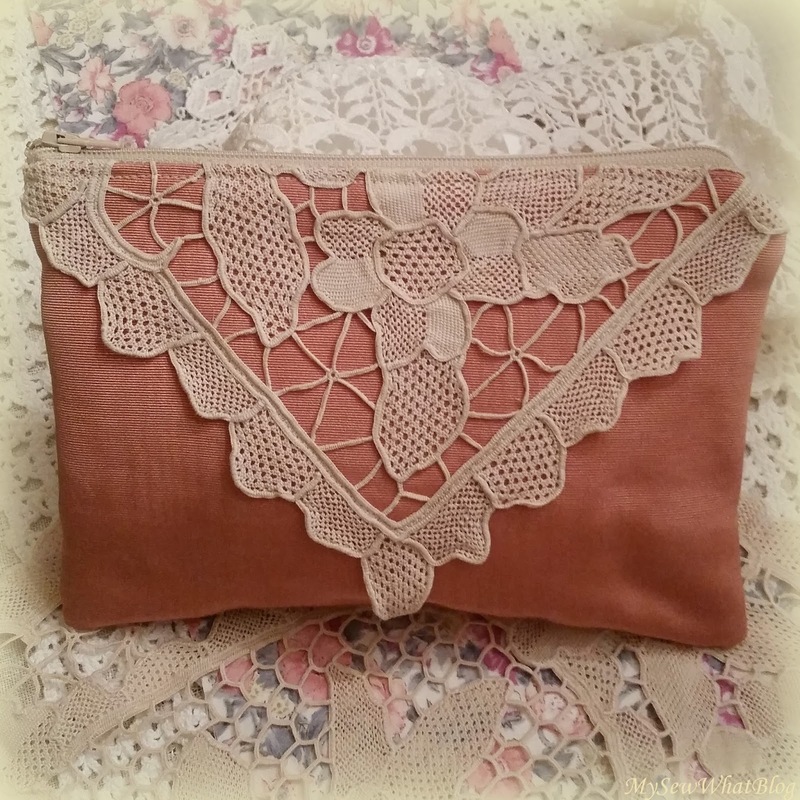 I would definitely use this as a clutch for an evening out. I have at least three lace sweaters this would go nicely with! They can be filled with goodies too if you feel as though the gift isn't quite complete on its own. Here I've added a pillow, an embellished votive and a roll of vintage lace. 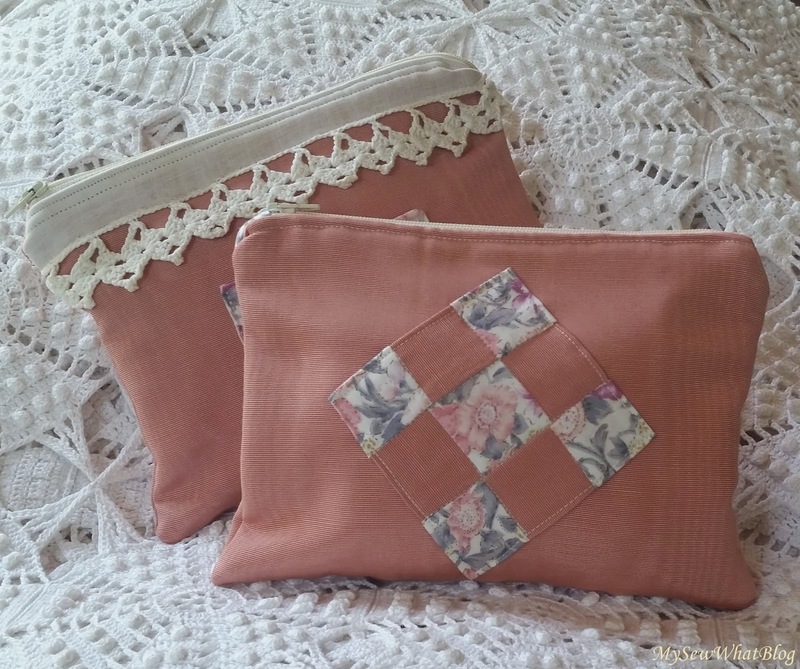 These zippered bags are a wonderful first project if you are a beginner sewist. I used three different methods for making these to see which one I preferred and let me tell you that the jury is still out! One method adds an additional step (the main fabric and lining are stitched to the zipper separately and not blindly, instead of sewing a fabric/interfacing/lining sandwich) and this makes the stitching easier because the zipper is visible. Another method assures that the corners come out a little more square.....I guess it all comes down to personal preference. My way may not be your way or the only way. At any rate, you should not be afraid to try stitching these up yourself. 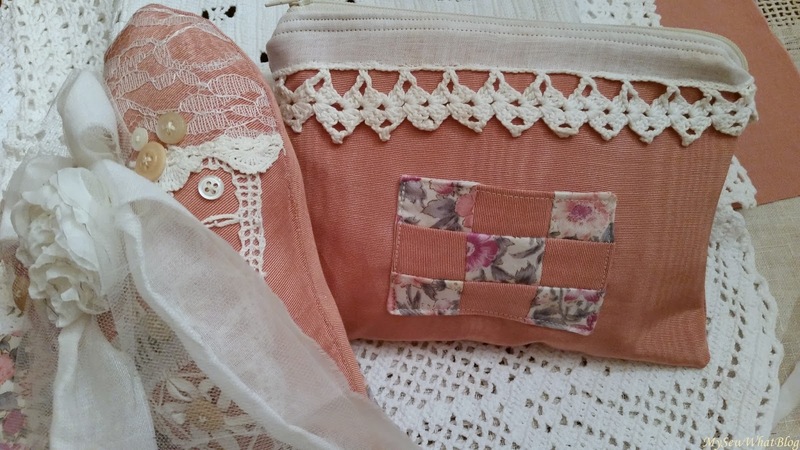 It's "SEW" nice to have these skills when you need a gift for a special occasion. Once you've mastered the basics, the sky's the limit. You can turn an ordinary cosmetic case into a cosmetic case extraordinaire!